Future Happens Here is an analog facilitation toolkit designed to take stakeholders into a game world to help them set aside their existing agendas and expectations about the future and create criteria for the future that they couldn’t previously have predicted. The facilitation happens in two phases, the first phase players are working towards individual goals of winning the game. The second phase, players come together to work collaboratively to write 4 scenarios about the future and then co-design strategies for how to stop or encourage a potential future outcome. The game mechanics are intended to demonstrate a transparent and open stakeholder engagement process that leads to co-designing policy actions and strategies. In this game world each player is responsible for their own actions and have equal access to changing the rules. How they use this responsibility is up to them and can create a positive or negative outcome. Some players may choose to work towards a collective future while others may choose more selfish approaches to sabotage others in the hopes of being able to dictate the future for themselves. Each time the game is played, the players determine the direction and results of the game. Each player is playing by the same rules. The rules are available for all the players to see and for all the players to impact through their own cards. The information you hold in your individual hand is the only advantage you have over others and that can change with one action played by another player. Players can do their best to set themselves up for success, but can never truly predict the actions of others. Ultimately, the game is intended to stimulate lateral thinking, creative dialogue, and to push stakeholders to think beyond their existing biases or perceptions of solutions for the future. The game builds a foundation for positive collaboration and solution-focused discussions. “We can’t solve our problems with the same thinking we used to create them.” – Albert Einstein. We need to give people tools to think differently, to build relationships and to gain empathy while developing strategies for the future. There isn’t an easy, out of the box tool for facilitators to guide a conversation about the future without everyone pushing their own perspectives and ideas. Future Happens Here is a game designed to help facilitate conversations about systems thinking and designing the future. The game simulates a collaborative stakeholder engagement process. The game is simple. 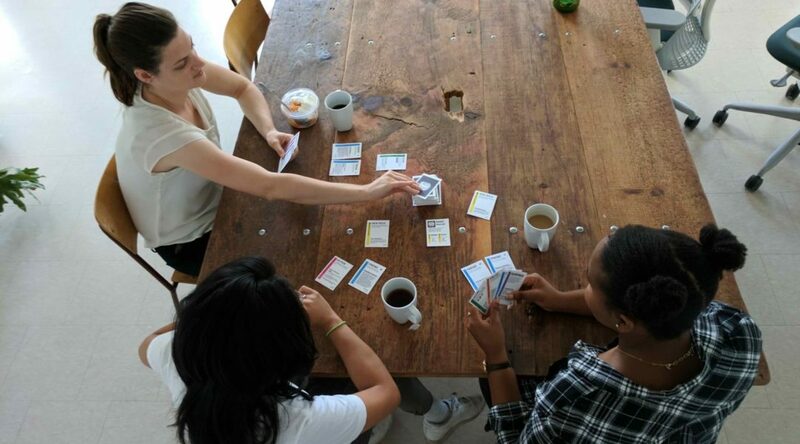 At its core, it is a card collecting game that leads to a collaborative writing exercise. The players are invited to suspend their existing assumptions, biases and roles to imagine alternative futures. The game builds skills in future-oriented planning, lateral thinking and systems change. A new generation of systems thinking means potential for new solutions to old problems. Learning skills like future-oriented planning, lateral thinking and systems change should accessible. Bringing these skills to players through a game is low barrier and risk free way to introduce mindsets and tools that have, up until now, been primarily available to academics, post-secondary students or professionals. Future Happens Here is in beta. The game was designed using co-design principles and methodologies. Staying true to its roots, Future Happens Here is going through playtesting and Trend Workshops in early 2018 with the goal of a newly released version in late 2018. Contact us to participate or get a copy of the game.